Biological warfare is scary and something of an actual threat. A new portable device could remove viruses or other toxins from a person’s bloodstream in the event of a biological disaster. The nearly pocket-sized Hemopurifier was created by Aethlon Medical and recently received FDA approval to treat Hepatitis C patients. The small tube resembles a dialysis cartridge and fits into a standard dialysis machine, but it is actually the last line of defense in a worst-case scenario. 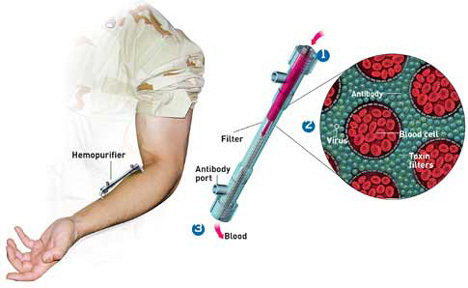 Its mechanics are simple: after it is inserted into the arm at a specific site, the body’s natural blood pressure acts as a pump to filter out nasty things like smallpox or Ebola. The thought kind of makes us want to faint, but then again we’ve never been through anything like dialysis before. 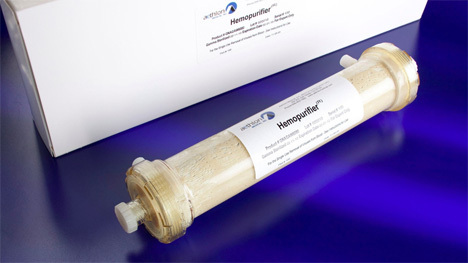 Aethlon believes that the Hemopurifier could be used to treat all kinds of diseases and infections, including AIDS and Hepatitis C. Several working examples of the Hemopurifier have been shipped to the Center for Disease Control and Prevention in Atlanta. Although it hasn’t been tested on Americans, a trial-run in India has been completed. No word yet as to whether or not it works on this virus. See more in Medical Marvels or under Science. July, 2013.